The maximum temperature on Friday was 35.6ºC (96.1ºF) and the minimum 27.8ºC (82ºF). The maximum relative humidity was 46 per cent and the minimum 27 per cent. OUTLOOK FOR SATURDAY: Possibility of dust or thunder storm. Heat wave conditions are prevailing in parts of Rajasthan. 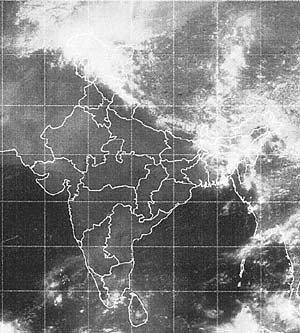 Rainfall: Rain or snow has occurred at many places in Jammu and Kashmir and at isolated places in Himachal Pradesh. Weather was mainly dry in the rest of the region. The chief amounts of rainfall in cms are: Himachal Pradesh: Bhang, Dhundhi and Solangnala 2 each and Jammu and Kashmir: Pahalgam 4, Banihal and Quazigund 3 each and Srinagar 2.Snowfall reports (cm): Himachal Pradesh: Patsio 20. Temperatures: Past 24 hours change: Maximum temperatures fell largely in Jammu and Kashmir, rose in east Rajasthan and east Uttar Pradesh and changed little elswhere. Departures: They were markedly below normal in Jammu and Kashmir, below normal in Uttar Prasdesh and Uttaranchal, appreciably above normal in Rajasthan, above normal in the rest of the region. The highest temperature in the region was 45.3°C recorded at Churu (Rajasthan). Forecast valid until the morning of May 4: Rain or thundershowers will occur at many places in Himachal Pradesh and Jammu and Kashmir, at a few places in Punjab and Uttaranchal and at isolated places in Haryana and Uttar Pradesh. Isolated duststorm/thunderstorm is likely in north Rajasthan. Weather will be mainly dry in south Rajasthan. Isolated thundersqualls are likely in Punjab and north Rajasthan. Forecast for Delhi and neighbourhood valid until the morning of May 4: Mainly clear sky with dust haze. Duststorm/thunderstorm accompanied with squall is likely in some areas. Maximum temperature will be around 40°C. Farmers weather bulletin for Delhi: Forecast valid until the morning of May 4: Duststorm/thunderstorm with light rain is likely at a few places. Squall with wind speed exceeding 65km p h is likely at isolated places.